Fallsview Indoor Waterpark is open year-round, making it one of the many great Niagara Falls attractions to check out on a family getaway. With 16 thrilling waterslides, a full-size wave pool, outdoor activity pool and sundeck, plunge bowl, 1,000 gallon tipping bucket, private cabanas, and adult-only Jacuzzis, there’s something for everyone in the family to enjoy. Not all Niagara Falls attractions are open year-round however, and if you want to enjoy some great ones like Hornblower Niagara Cruises, White Water Walk, and WildPlay Zipline to the Falls, then make sure to plan your exciting Niagara Falls family getaway before they close! This year, Hornblower Niagara Cruises is offering boat rides to the Falls until the end of November, which means there’s still plenty of time to experience this iconic attraction. Choose between the classic Voyage to the Falls Boat Tour, Voyage to the Falls Evening Boat Tour, Falls Illumination Cruise, and Falls Fireworks Cruise, and get ready to journey into the mist and get as close as you can get to the breathtaking Niagara Falls. The Niagara Parks White Water Walk gives you an up-close view of the Niagara River and class 6 white water rapids right from the river’s edge. It’s a self-guided attraction that immerses you in the beautiful nature of the Niagara Gorge, and gives you the chance to take it all in from a quarter mile boardwalk and a number of viewing platforms. Looking for some thrills while visiting Niagara? Check out the WildPlay MistRider Zipline to the Falls attraction. 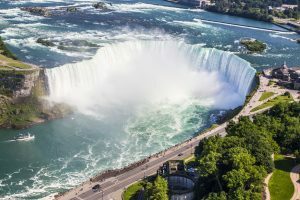 It offers a breathtaking 670 metre ride to the base of the Canadian Horseshoe Falls where you’ll land atop a beautiful falls observation deck. And for additional thrills, make sure to visit WildPlay’s Whirlpool Adventure Course featuring suspended obstacles and ziplines high above the Niagara Gorge. And to make planning your Niagara Falls family getaway easy, book a Hotel & Waterpark Package that will connect you with the very best accommodations and entertainment that Niagara Falls has to offer.